I went to see the new Jim Sheridan movie Brothers last night (more on that soon) and I suddenly realised how rarely I see a movie sight unseen. All I knew about Brothers were the three leads actors and the director, and it was quite exciting to see something without already having seen three trailers on Apple, read a plot synopsis on IMDb and overheard the twist ending on the tube. So I’ve decided to set myself a challenge. I’m going to choose an upcoming movie that I know nothing about, and attempt to keep it that way right up until the moment I see it at the cinema. 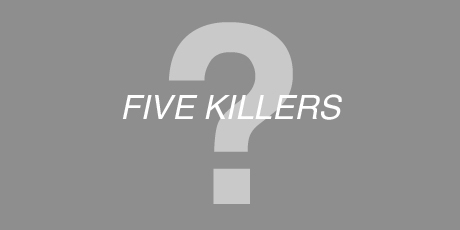 I’ve randomly selected the movie Five Killers, of which I know absolutely nothing other than the fact that it’s being released in the US by Lionsgate on the 4th June. This means I have to get through 6 months of avoiding every poster, trailer, article, blog post, press release and gossip site as they desperately try to keep me informed. I bet you I know the lead actors within the week.